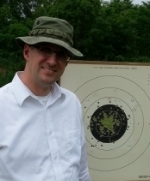 My 1911 sends brass almost straight up and beats the heck out of my dot. I want to put a new Aimpoit 9000SC on it but I would like to see if I could fix this first so I don't beat this one up too. 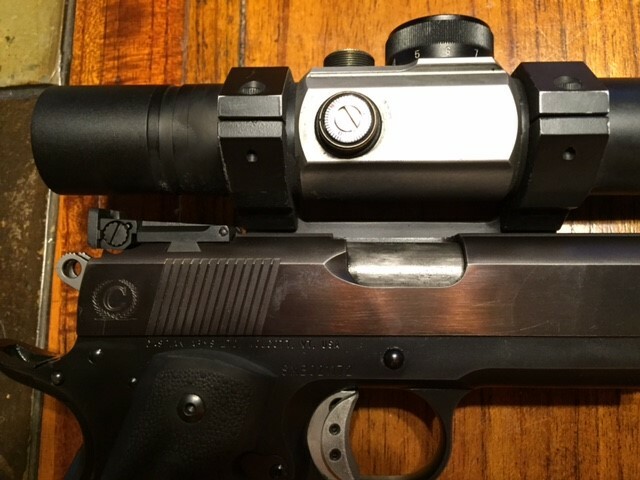 4gr of bullseye will bounce it off the scope fast enough apparently to keep from having alibis but when I start going lower I get cases trapped between the scope and slide. 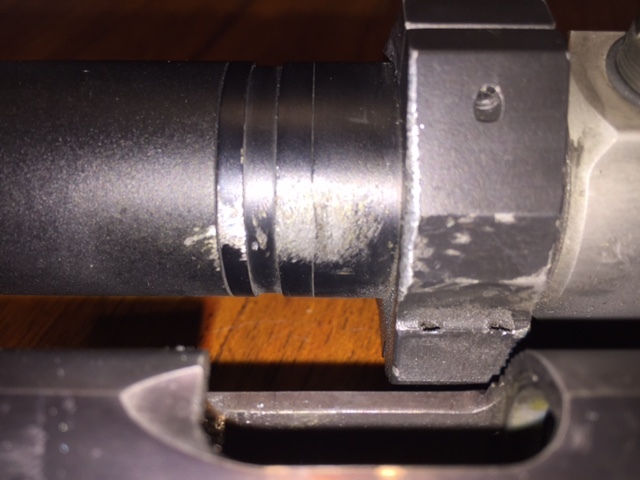 Do any of you gunsmith types have a easy suggestion/fix? Too much or not enough extractor tension? Ejector length? More likely where the ejector hits the back of the case first. I know an easy fix. Roddy installs this shield on the pistols he works on. Even when everything is adjusted perfectly the casings don't seem to land right on top of each other. 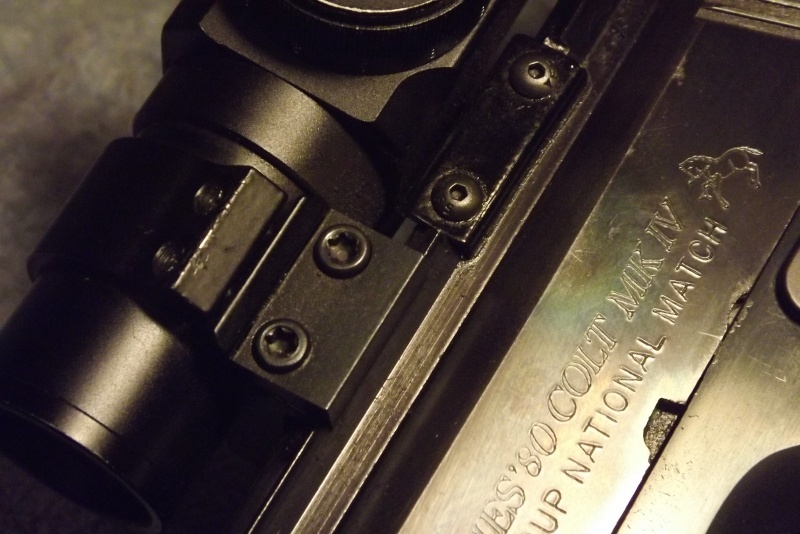 The shield protects the scope from any cases that don't know where they are supposed to go. It is working on this pistol. I would look at the tension of the extractor to start off with. 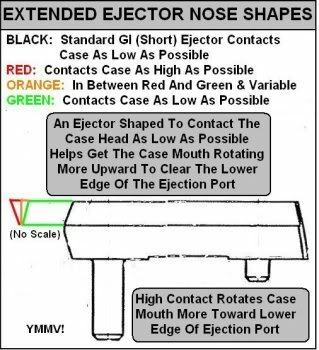 Is your ejection port lowered and if so by how much? Standard ejector or long ejector? Some pictures of your slide would tell a lot. This is a standard Caspian frame and slide. No lowering was done to the port. 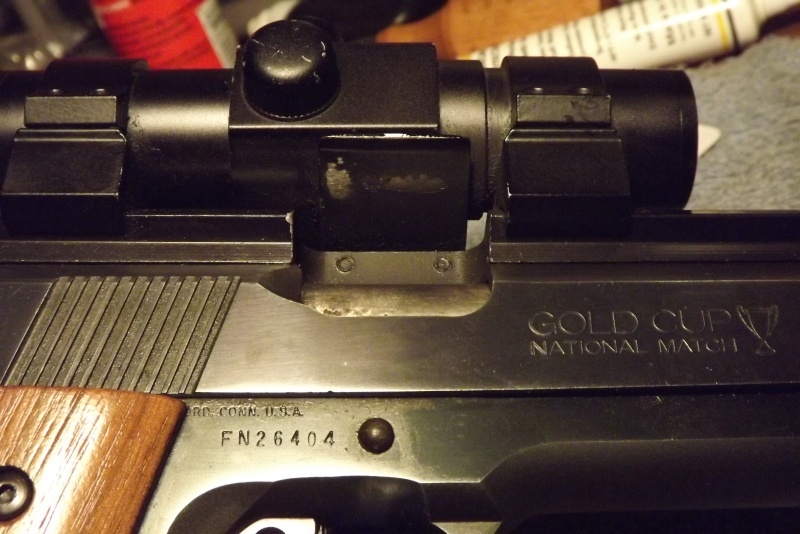 The damage to this scope is not as bad as the one I had on it before. The other one looked like a hole was going to crack open in the scope tube. KC which direction should I go on the extractor? More or less? Replace your rail with an Al Marvel rail and never worry about it again! Better for you maybe but I like the feel of the frame mount better than the slide mount. I know this can be fixed to be reliable. My frame mount Baer spits them out very consistently with only a couple of failures in 10,000 or so rounds. Scott, rather hard to say. But my guess is less tension on the extractor. Ejector looks to be OK in length. Lowering the port and putting a good bevel on the inside would probably be the best bet. 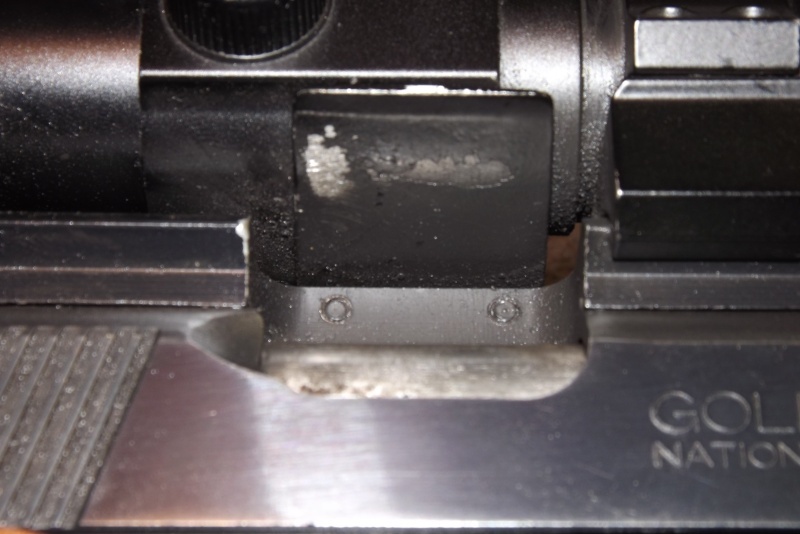 Do you see a lot/heavy brass marks on the inside of the ejection port? Your Baer frame mount also site about .250 higher than the frame mount in the pic. Red Buff I'm guessing? Check the shape of your ejector I've seen some ejectors that impact the case so low it causes an almost vertical ejection. Without a lowered ejection port a low ejector impact (=high case ejection) is probably correct. Right out of the box one of my 1911's would eject the case over my head with an occasional one hitting me in the forehead. I tuned the extractor which helped but I eliminated the problem completely after filing the ejector as per the picture a little bit at a time. Don't over due it. Another KISS option is to put black electrical tape on your scope tube. Even if you have to replace it every match it's cheap and low risk. You may have to double it up but it should protect the scope tube from slowly wearing away. Ranger band on the scope. Assuming it doesn't slap it back into the slide you will be good to go. jmdavis wrote: Ranger band on the scope. Assuming it doesn't slap it back into the slide you will be good to go. What is a "Ranger band"? Piece of bicycle inner tube cut to make a VERY strong rubber band. Works great for keeping things like the square pellet containers or altoids tins closed. 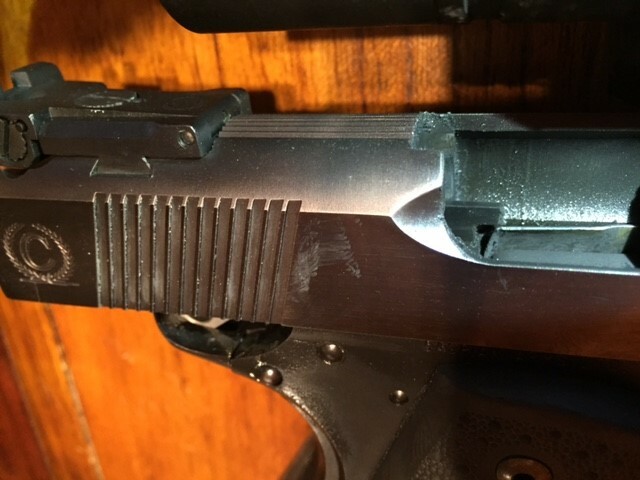 Slapped on a slick pistol grip it provides some extra stickiness to keep ones hand in place. Very strong and very light. I lowered the ejection port and put 70 rounds through it this morning with no malfunctions. It looked like only about 4 hit the scope instead of all.